The Treasury of the British Antarctic Territory has launched their latest crown highlighting the extraordinary animals of Antarctica. 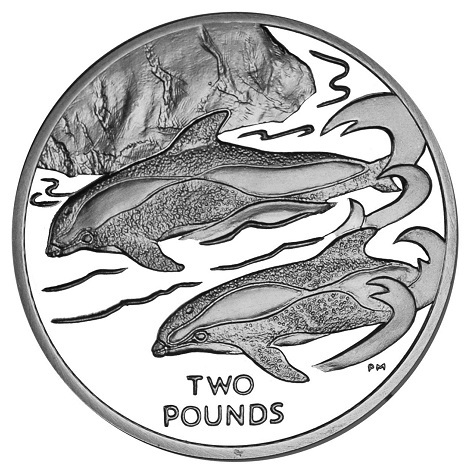 This year’s coin includes images of the hourglass dolphin, a small species of dolphin with a compact body and a striking black and white pattern that is generally found in a circumpolar band around the Antarctic. First described in 1824 during a French expedition as a ‘cruciger’ or “cross-bearing” dolphin, these striking aquatic mammals have distinctive markings that have earned them their more common name: the “hourglass” dolphin. Hourglass dolphins are considered one of the rarest marine mammals. They can generally be seen in groups of eight or less, though larger schools of around 60 animals have been reported. The species seems a bit shy, as only a dozen or so hourglass dolphins have been examined; most of what experts know about them comes from the rare observations of those who have spotted them. From what has been ascertained about their eating habits, they enjoy a diet composed of small fish, squid, and crustaceans, and can often be seen feeding with other groups of cetaceans, such as pilot whales and minke whales. Hourglass dolphins seem to have a playful streak as they appear to enjoy bow riding, which involves riding the crest of waves created in the ocean, and they are known to approach boats from a distance at great speed in pursuit of such waves. This warm-blooded, air breathing species is most at home in very cold waters such as those found in the British Antarctic Territory. The coins are produced by the Pobjoy Mint, UK on behalf of the British Antarctic Territory. The reverse side depicts a pair of hourglass dolphins swimming in Antarctic waters among the icebergs. The coin’s denomination of two pounds appears below the primary design. The obverse of the coin carries an effigy of Her Majesty Queen Elizabeth II by Ian Rank-Broadley. The year of issue appears in the legend around the edge. This coin is available in both cupro-nickel (BU) and sterling silver (Proof), with the precious metal versions having been carefully struck four times. Frosted high-relief sculpting rises from a brilliant mirror-like background. For more information on this and other coins issued by the Treasury of the British Antarctic Territory, please visit the Web site of the Pobjoy Mint. Information is offered in English, with international orders dispatched where applicable.